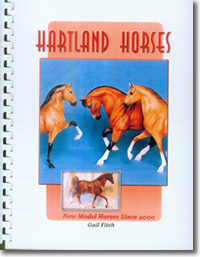 Hartland Horses: New Model Horses Since 2000 (first edition), by Gail Fitch, was (self-)published on March 17, 2010. Covering the 2000-2007 models, it is155 pages plus covers, on heavy weight paper, with a plastic comb binding, abundant color photos, and very detailed information. The press run, priced at $60 plus $4 shipping = $64, is sold out. The book was replaced in 2012 with the book of the same name published by Schiffer Publishing, Ltd.
All of the Hartland books I self-published in 1983-1998 were, in effect, replaced by the 1999 and 2000 Hartland books from Schiffer Publishing, Hartland Horsemen and Hartland Horses and Dogs, respectively. The 1983-1998 books were copyright-registered in Washington, D.C. I have a record of who bought them. All but a few were signed and numbered, and I can recognize the unsigned ones. I still sign and number the books even though they are mass produced. - - Gail Fitch, October 21, 2005; revised June 21 & 24, 2015.
by Gail Fitch. Horse-and-rider sets, values, and company history; 126 pages, 121 color photos, 119 b/w photos. The 1998 book changed to a vertical format, still with spiral binding. One edition: March 1998. This book replaced the "horse-and-rider set" portion of my 1983-1995 books, Hartland Horses and Riders. It is the first book that included values. For rider sets, a "three-dimensional" table makes it easy to find values based on the condition, scarcity, and completeness of the sets. This was the second model horse book ever published--the first was Cheryl Abelson's Hagen-Renaker book in 1980. Hartland Horses and Riders included Hartland's individual horses, horse families, horse-and-rider sets, and company history and artistry. All had spiral (plastic comb) bindings. All except the Third Edition were printed in Milwaukee, Wisconsin. The First and Second Editions (1983-1988) have a walnut Three-Gaiter at upper right on the cover. • First Edition: 72 pages, 131 color photos, 6 b/w photos. Three printings: February 1983, December 1983, and June 1985. • Second Edition: Added models from 1983-1986. 76 pages, 131 color photos, 9 b/w photos. Three printings: June 1986, January 1987, and February 1988. On the Third Edition (1989), a cherry (dark brown) Tennessee Walker appears at upper right. • Third Edition: Added models and company history through 1988. 100 pages, 152 color photos, 35 b/w photos. One printing: May 1989 (in Santa Barbara, California). The Fourth through Sixth Edition books (1991-1995) were two-volume sets. The cover of Vol. 1 is in color; Vol. 2 has a b/w cover with the same photos. • Fourth Edition: Added models from 1989-1991 and interviews with many additional Hartland personnel (owners, sculptors, etc.). Sold in two volumes totaling 232 pages, with 200 color photos, 149 b/w photos. (vol. 2), January 1992 (vol. 1), March 1992, June 1992, September 1992, and March 1993. • Fifth Edition: Added models from 1992-1993. Five printings: November 1993, February 1994, August 1994, February 1995, and April 1995. • Sixth Edition: Added models and company history from 1994-1995. Two volumes totaling 239 pages, with 222 color photos, 149 b/w photos. Color and gaits of horses and models; model manufacturers; horse color inheritance; photo guide to model horses (Breyer, Hartland, Japan chinas, etc.). 54 pages with 46 color photos, 31 b/w photos (with many models per photo). Second Edition: Three printings: November 1986, March 1987, and March 1988. More model horse photos; includes gait sequences (drawings) by Paul Brown and Beswick catalog pictures (reprinted with permission). Illustrates 312 different shapes (molds) of model horses and identifies their gaits/poses. 68 pages, 16 color photos, 127 b/w photos, and line drawings by the author. The resin artists; more on model manufacturers; model gaits are compared with photos of horses and Paul Brown's drawings; photo guide adds Eustis Originals, Kaiser Porcelains, and others (used with permission); carousel horses, toy horses, and public sculpture. Illustrates 585 different shapes (molds) of horse models. Two volumes totaling 302 pages, 20 color photos, 284 b/w photos of both real horses and models, and 30 line drawings by Hagen-Renaker (used with permission). One volume has a color photo cover, and the other volume has the same photos in black-and-white. "The photos that follow include one of nearly every mold of the major makes of model horses, plus some toys and limited edition horse sculpture. It would have been nearly impossible to show or list every color of every mold, and the point of this book was to simplify matters by thinking of model horses in terms of their molds." (A special, abridged edition of Horse Colors and Gaits). Two printings: 1994 and 1995. 70 pages, 10 color photos, 105 b/w photos.